A summer visitant and regular migrant; formerly bred in Minnesota from 1970 to 1992. The Cattle Egret was a very rare species during the Minnesota Breeding Bird Atlas (MNBBA). Primarily found in the southern United States from North Carolina to New Mexico and California with populations expanding north as far as southern Canada. In the United States, nesting has been confirmed in all contiguous states except Montana, New Hampshire, Washington, and West Virginia. Cattle Egrets also occur in South America, Mexico, Central America, and the West Indies as well as in many other parts of the world including Africa, Asia, western Europe, and Australia. Its range expansion has been described as “one of the most rapid and wide reaching natural expansions of any bird species” (Wikipedia). Highest breeding densities are found in the core of its breeding range in the southern states, especially Florida, Louisiana, Texas, and southern Oklahoma (Figure 1). Assigned a Continental Concern Score of 9/20 by Partners in Flight and designated a species Not Currently at Risk by the North American Waterbird Conservation Plan. A strongly migratory species, during the winter the Cattle Egret leaves the northern part of the breeding range and is found around the Caribbean Islands, Mexico, Central America, and northern South America. Juveniles disperse widely, often long distances and in random directions, and rarely return to their natal colony to breed. The species is noted for its association with feeding cattle, which flush their desired prey, such as grasshoppers and crickets. Food is mostly insects but also frogs, crayfish, bird eggs, and nestlings. Like all herons and egrets, foraging during the breeding season can be up to 15 to 30 km from the colony but usually is 3 to 10 km (Telfair 2006). Cattle egrets usually forage in small to large flocks in upland foraging sites on lawns, large fields, and pastures and along watercourses. A platform or shallow bowl constructed of sticks and placed in trees or shrubs; may use abandoned nests of other species. This colonial nesting heron is gregarious at all seasons. Cattle Egrets nest and roost in colonies with other herons. They may begin nesting about 3 weeks later than native herons and nest 7 to 9 weeks longer (Telfair 2006). Breeding distribution and relative abundance of the Cattle Egret in North America based on the federal Breeding Bird Survey, 2011–2015 (Sauer et al. 2017). The Cattle Egret is an Old World species that arrived on the eastern coast of South America about 1877, presumably having flown across the Atlantic Ocean from Africa. Its dispersal tendencies are remarkable, and even now it is regularly seen at sea (Telfair 2006). It originally was native to the tropical and subtropical areas of Africa and Asia and expanded its range to the northern Mediterranean in Spain and Portugal at about the same time as it crossed the ocean to South America. It first arrived in North America in Florida in 1941, bred there in 1953, and rapidly spread throughout this continent, both east and west, to the southern Canadian provinces. Obviously, the Cattle Egret was not part of the avifauna in Minnesota when Roberts wrote his book in 1932. The first report of the species was in June 1959 in Pope County (Hanna 1959), which is the same county in western Minnesota where it was later found nesting. There were 9 more records from 1961 to 1970, mostly in southeastern counties and the Twin Cities but 2 in western Minnesota (Lac qui Parle County in 1969 and Stevens County in 1970). On August 21, 1970, a flock of 8 was spotted in northern Grant County (Moos 1971). All observations in western counties were in areas where there are large multispecies heronries, where the Cattle Egret was subsequently found nesting. The documented breeding records are from (1) Lake Johanna, Pope County, in 1971 (Hitman 1972), 1984 (Hendrickson and Eckert 1985; Guertin and Pfannmuller 1985), and 1985 (Wilson and Shedd 1986); (2) Pelican Lake, Grant County, in 1970 (Hitman 1972), 1971 (Eckert 1973), 1973 (Wyatt 1973), 1985 (Wilson and Shedd 1986), and 1986 (Shedd and Wilson 1987); (3) Long Lake, Kandiyohi County, in 1984 (Guertin and Pfannmuller 1985); (4) Big Stone National Wildlife Refuge (NWR), Lac qui Parle County, in 1977 (Eckert 1978) and 1978 (Green 1979); and (5) Thief Lake Wildlife Management Area (WMA), Marshall County, in 1992 (Wiens 1993; Minnesota Biological Survey). During the time of documented nesting, the first Minnesota specimen of the Cattle Egret was collected in November 1975 in Faribault County (Zink and Frye 1977). In summary, Cattle Egrets have nested in three large heronries (Lake Johanna, Pope County, 3 years; Long Lake, Kandiyohi County, 1 year; Pelican Lake, Grant County, 4 years) and in two wildlife areas (Big Stone NWR, Lac qui Parle County, 2 years; Thief Lake WMA, Marshall County, 1 year). The time span of these documented breeding records is 1971 to 1992. There have not been any nesting records since then, although there have been yearly summer observations in subsequent years (1993–2014). Many of these observations have come from the same counties and from many other counties in the Prairie Parkland Province as well as some in the Eastern Broadleaf Forest Province. As is the case for two other small herons, the Snowy Egret and Little Blue Heron, which were first recorded nesting in the state during this same time frame, it is not clear if the absence of nesting records is due to a lack of intensive, ground surveys of colonies or to the fact that these three species are not presently nesting in the state. Periodic aerial surveys conducted at many of these sites since 2004/2005 have failed to document the species (Hamilton and Cuthbert 2016). Based on the number and seasonality of records detailed in the Minnesota Ornithologists’ Union’s (MOU) seasonal report database, these three herons have a summer status of vagrant (Little Blue Heron), visitant (Snowy Egret), and regular (Cattle Egret). All Minnesota nesting sites for the Cattle Egret are along the western margin of the state, adjacent to the Dakotas, where a larger population has been nesting since the 1970s (Tallman et al. 2002). As a migrant, the Cattle Egret is regularly seen in the same western prairie and eastern deciduous forest provinces where it is observed in summer, but it is a rare migrant in the coniferous northeastern region. Many of the larger flocks in western counties in the fall are juveniles, probably wandering from colonies in the Dakotas (Ellwanger 1997). There are scattered spring records (about 6) in the northeastern counties (Laurentian Mixed Forest Province) and many late fall records (about 20) along the North Shore of Lake Superior in all 3 counties at birding hot spots, where vagrant species are often sited. The dates range from mid-October to mid-November and fit the pattern of this egret dispersing long distances after the breeding season. During the MNBBA, participants reported 7 Cattle Egret records in 7 different blocks; all were coded as “observed” records (Figure 2 and Table 1). Although surveyors originally reported 2 “possible” records, lacking any documentation to support possible or probable nesting, they were changed to “observed.” As noted earlier, Cattle Egrets can travel far from the breeding colony to their primary foraging territories. As a result, unless birds are seen on the nest, other observations cannot reasonably be assumed to indicate possible or probable breeding status. During the 5-year atlas period, other Cattle Egret breeding season records were submitted to the MOU. The total of 22 records, MNBBA plus those submitted to the MOU, are all distributed throughout the western and southeastern colonies similar to the distribution described above. Although the Cattle Egret occurs every year during the summer nesting season (June and July), with scattered records in 2 to 10 counties each year, breeding evidence has not been documented since 1992. Breeding distribution of the Cattle Egret in Minnesota based on the Breeding Bird Atlas (2009 – 2013). Summary statistics for the Cattle Egret observations by breeding status category for all blocks and priority blocks (each 5 km x 5 km) surveyed during the Minnesota Breeding Bird Atlas (2009-2013). The Cattle Egret nests in both coastal and upland situations, usually in established mixed-species colonies of other herons. The site of the colony is in “varied habitats and diverse vegetation: coastal barrier, marsh, and dredge-material islands; periphery and islands in reservoirs, lakes, quarries, and wetlands; swamps; riparian and upland woodlands and groves, with and without understory. Upland sites may or may not be associated with water; nest-site vegetation may vary” (Telfair 2006). The North American Waterbird Conservation Plan gave an estimated population for this species as 1.16 million breeders (Texas only) with a category of “not currently at risk” (Kushlan et al. 2002). Texas is the heart of the Cattle Egret’s population abundance, but the species is also common north to southern Nebraska and through the southeastern coastal states to South Carolina. The disjunct breeding population in the Prairie Pothole Region, which is entirely within the Dakotas, where it is locally common, comprises less than 1% of the continental population (Beyersbergen et al. 2004). Partners in Flight (2017) estimated the global population to number 3.8 million birds. 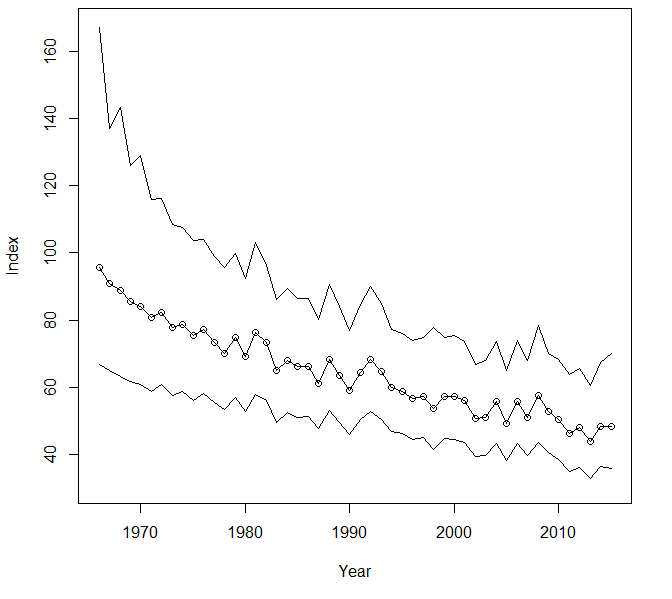 Long-term monitoring data collected by the federal Breeding Bird Survey (BBS) demonstrated a significant annual decline of 1.38% per year from 1966 to 2015; the downward trend slowed in the most recent 10-year reporting period, from 2005 to 2015 (Figure 3). During this same time period, Mississippi was the only state with a significantly increasing population, having an average annual increase of 3.33% (Sauer et al. 2017). Populations also demonstrated a significant annual increase in two regions: (1) the Oaks and Prairies, which extends from central Oklahoma south through central Texas (average annual increase of 8.03%); and (2) the West Gulf Coastal Plain/Ouachitas, which spans northwestern Louisiana, eastern Texas north of the Gulf coast, southeastern Oklahoma, and southwestern Arkansas (average annual increase of 3.32%). After its first breeding in Florida (1953), the Cattle Egret’s range expansion was rapid. The expansion observed in North America has been worldwide and well documented, “encouraging speculation about those aspects of its life history and ecology that have most promoted growth in range and numbers. . . . Apparent keys to the spread and success of the Cattle Egret are its dispersal tendencies, gregariousness, diet, foraging adaptability—especially as humans increasingly convert large areas of landscape to pasture for livestock production and to crop fields” (Telfair 2006). The species reached a peak in its population growth in the United States about 1971. It then stabilized, and the growth rate lessened. There has been a decline in the eastern states’ populations in recent decades; in some places north of the Carolinas the decline has been dramatic (Telfair 2006). Some of the decline is attributed to conversion of agricultural lands to residential development and to predation by raccoons. However, these factors are rather universal, and in some regions where Cattle Egrets are declining, other waterbird populations are increasing. Nest availability also appears to be an important factor regulating populations. Cattle Egrets seek active heronries where other species have already initiated nesting (Telfair 2006). Although there are no current nesting records in Minnesota, there are active breeding populations in the Dakotas. In North Dakota, which is at the northern limit of the species’ range, there were eight colonies surveyed in 2014–2015, and several are in the range of 50 to 100 breeding pairs (Drilling 2015). In South Dakota, the Cattle Egret is considered a “fairly common breeder in the northeastern part of the state,” and there are several colonies, including at Sand Lake NWR in Brown County (Tallman et al. 2002). The dispersers in Minnesota, spring through fall, most likely come from this disjunct Great Plains population. Breeding population trend for the Cattle Egret in North America for 1966–2015 based on the federal Breeding Bird Survey (Sauer et al. 2017). The Cattle Egret is not listed in any federal or state program that addresses species’ endangerment or risk. As mentioned above, the North American Waterbird Conservation Plan gives it a category of “not currently at risk.” Similarly, in the Northern Prairie and Parkland Waterbird Conservation Plan, which addresses the breeding population centered in the Dakotas, it was given the status of “low risk.” Partners in Flight (2017) assigned it a moderate Continental Concern Score of 9/20; the principal concern was its declining population trend. Although the Cattle Egret is a nonnative bird and its range expansion has been dramatic, it is not considered an “invasive species,” according to the definition of that designation as “likely to cause harm” (Avery and Tillman 2005). The Cattle Egret has demonstrated the ability to occupy landscapes that have already been dramatically changed by agricultural development. Factors that influence insect food availability for this egret are often associated with agricultural practices, especially cattle pastures and associated water sources, which provide a high density of insect prey that the species depends upon. Agricultural land-use changes can therefore have a detrimental effect on populations. Colony sites are also at risk from disturbance or destruction. Environmental contamination by pesticides has been studied, but the results do not indicate any adverse effects on Cattle Egret populations (Telfair 2006). The “State of the Birds 2010 Report on Climate Change” assessed the species’ vulnerability to climate change as low (North American Bird Conservation Initiative 2010). Avery, Michael L., and Eric A. Tillman. 2005. “Alien Birds in North America – Challenges for Wildlife Managers.” In Proceedings of the 11th Wildlife Damage Management Conference, edited by Dale L. Nolte and Kathleen A. Fagerstone, 82–89. Eckert, Kim R. 1973. “Cattle Egrets and Little Blue Herons in Grant Co. Heronry.” Loon 45: 21–22. Ellwanger, Lane. 1997. “Summary of Cattle Egret Sightings in Big Stone County.” Loon 69: 46. Hanna, Darrell M. 1959. “Possible Sight Record of the Cattle Egret in Minnesota.” Flicker 31: 103–104. Moos, Louis M. 1971. “Cattle Egret Observation.” Loon 43: 96. Wiens, Terry P. 1993. “The Summer Season: 1 June to 31 July 1992.” Loon 65: 14–31. Wyatt, William H. 1973. “Cattle Egrets Nesting at Pelican Lake.” Loon 45: 100.